For more than 170 years the Evangelical Alliance has been committed to strengthening God's church in the UK and around the world. Explore more of our history and the ways that we've helped Christians and churches share Jesus and speak up for Him in society. The Evangelical Alliance is founded at a meeting of 800 evangelical leaders in London on 19 August 1846. The motto of the Evangelical Alliance when it was founded was: "We are one body in Christ", and unity was the key principle. By the end of 1846, the Evangelical Alliance had 3,000 members. During the mid-19th century, religious freedom for all in Europe was high on the Evangelical Alliance's agenda and led to some of the Evangelical Alliance's first engagements with government advocacy. A letter was sent to the Sultan of Turkey appealing for the removal of the death penalty for Muslim apostates. Messages were also sent to Queen Victoria, US President Franklin Pierce, Napolean III, and Emperor Franz Joseph I. The campaign was successful. In 1857 all 900 delegates at the Evangelical Alliance’s third International Conference in Berlin were invited to take a trip to Potsdam at the King of Prussia’s expense during which time they addressed issues of religious persecution in Europe. A memorial after the trip from the Executive Council read: "They place on record their deep sense of obligation to the King of Prussia for the personal interest which he has manifested in the wrongs endured by his subjects who have suffered from the operation of intolerant laws, and the enlightened and liberal views by which he has guided the recent measures of his government in relation to this subject." The Evangelical Alliance launches the first ever Universal Week of Prayer. This became a major international Christian event with tens of thousands of copies of prayer materials being distributed around the world and translated into many different languages. The Week of Prayer still continues today and is now managed by the European Evangelical Alliance. A personal visit of Alliance delegates to the Austrian Emperor successfully brings relief from persecution to Christians in Bohemia who have been prevented from meeting for worship or Bible studies. When the delegation arrived in Vienna they found that the Emperor was at his Hungarian palace and embarked on further travel by horse-drawn carriage. They eventually managed to secure agreement that meeting for worship and Bible study in Bohemia would be permitted. The Evangelical Alliance established itself as key national prayer leader and organised many large prayer gatherings during World War I. 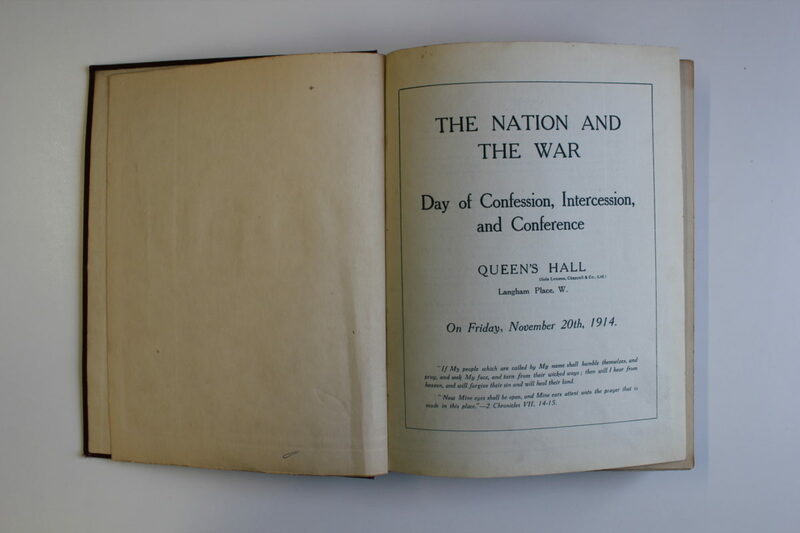 In November 1914 a conference for church leaders, entitled 'The Nation and War: a day of confession, intercession and prayer' was held. This inspired leaders including the Archbishops of York and Canterbury to call for a national day of "humble prayer and intercession" to take place on the first Sunday of 1915. The King gave his support to the day. There was a joint objective for the Evangelical Alliance praying for peace, but also to encourage spiritual unity and deliberately invited leaders from different denominations to speak at the meetings. The rise in communism across Europe after World War 1 was seen as a great threat by evangelicals during the interwar years, with the Evangelical Alliance taking a lead in supporting Christians around the continent. The Russian revolution was seen as a great threat by European Alliances, who joined forces to support Orthodox and other Christians in the Soviet Union. Having become general secretary of the British Organisation at the age of 30 in 1904, H. Martyn Gooch took on an ‘ambassadorial role’ in the 1920s and 1930s in support of European evangelicals, travelling extensively. The Evangelical Alliance hosts the National Day of Prayer, supported by King George VI, and does significant work among refugees. 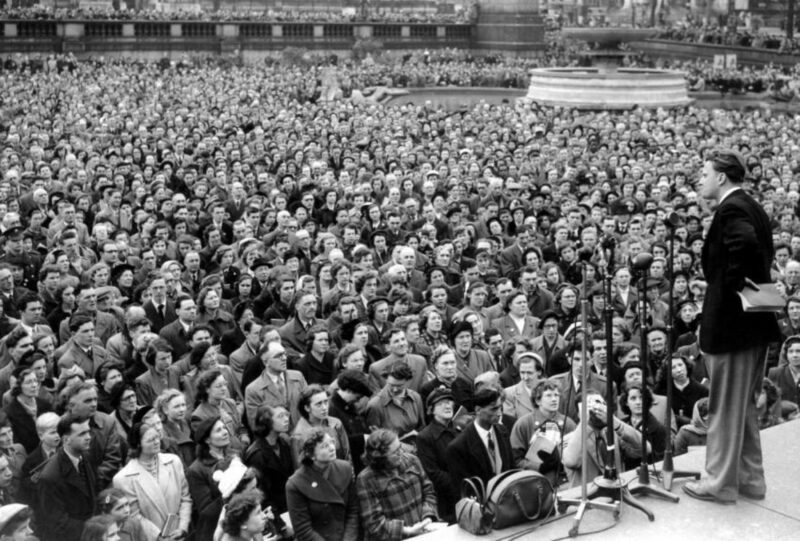 During World War II, the Evangelical Alliance was once again at the forefront of national prayer, organising a number of large rallies. The Evangelical Alliance organised large-scale monthly prayer meetings for the war, attended by the Archbishop of Canterbury and was actively involved in supporting refugees from Europe. The prayer meetings had an average attendance of 2,500. The Evangelical Alliance co-founds the World Evangelical Fellowship, now known as the World Evangelical Alliance. The Evangelical Alliance focuses on evangelicalism across the UK. 38,000 people come to faith at the Harringay Crusade with Billy Graham, sponsored and led by the Evangelical Alliance. An estimated two million attended events at 15,000-capacity Harringay Arena. The rally was supposed to run for four weeks, but ended up being extended to three months. Around 120,000 people came to the last night of the crusade at Wembley stadium. Demand was so high that the Evangelical Alliance had to organise an overflow rally for some 55,000 people at White City. During the crusade, Dr Graham employed his trademark style of preaching the gospel in an accessible way before inviting people to make a response in an altar call. Thousands did. This decision to provide significant finances towards the crusades was to cripple the Evangelical Alliance financially as they spent so much money on the crusades and the follow-up work that they used up all their reserves. But the popularity of the Graham Scotland crusade the following year brought in much-needed funds and the Evangelical Alliance was brought back from the brink of extinction. The cultural changes of post-war Britain challenged Christian culture and with it the Evangelical Alliance. 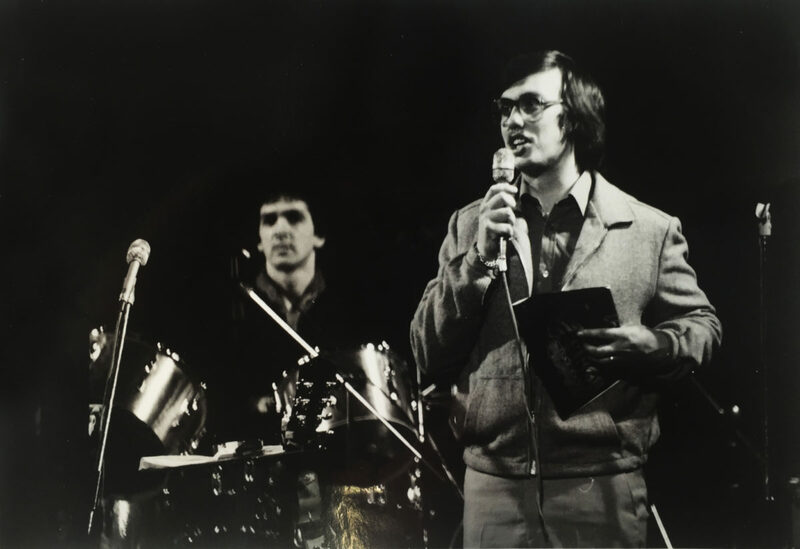 While general secretary Gilbert Kirby worked hard to build understanding and good relations across the UK church and particularly with the Pentecostal denominations, some of the Evangelical Alliance's membership struggled to understand the rise in the charismatic movement. However during this time some Pentecostal leaders became active on the Evangelical Alliance’s council. A public dispute between evangelical leaders over ecumenical unity causes division within the community. Challenges also came from a disagreement over whether evangelicals should stay within mixed denominations or whether they should withdraw. A public disagreement between John Stott and Martin Lloyd-Jones at a conference organised by the Evangelical Alliance in 1966 resulted in the Evangelical Alliance losing some members and for a number of years the organisation was less active than it had been in the 1940s and 1950s. TEARFund is formally established after years of giving from Christians around the UK to the Evangelical Alliance Relief fund (EAR), launched in 1960 as a response to famine and war . In 1960, some 40 million people worldwide were made refugees by war or disasters. Coverage of the suffering sparked a spontaneous outpouring of compassion among UK Christians, who sent money to the Evangelical Alliance. Known at first as EAR, the Evangelical Alliance Relief fund was created to distribute the funds to evangelical agencies caring for the needs of refugees around the world, and money kept coming in to this fund throughout the decade. In 1967 former curate George Hoffman was hired by the Evangelical Alliance to develop the fund’s work. On 29 May 1968, George and members of the Evangelical Alliance Relief Fund Committee met for the first time, determined to marry Christian compassion with practical action. Together they quickly established a vision for the new organisation, to be called Tearfund - The Evangelical Alliance Relief Fund. Powerful images, striking design and provocative messaging characterised publicity materials and propelled Tearfund onto the Christian stage, urging a new, radical understanding of what it means to bring good news to the poor, caring for their physical as well as spiritual needs. Tearfund’s fresh outlook proved attractive to one of the UK’s most high profile Christians, popstar Cliff Richard, who in 1969 performed two concerts at the Royal Albert Hall, raising money for Tearfund and going on to become a long term supporter. 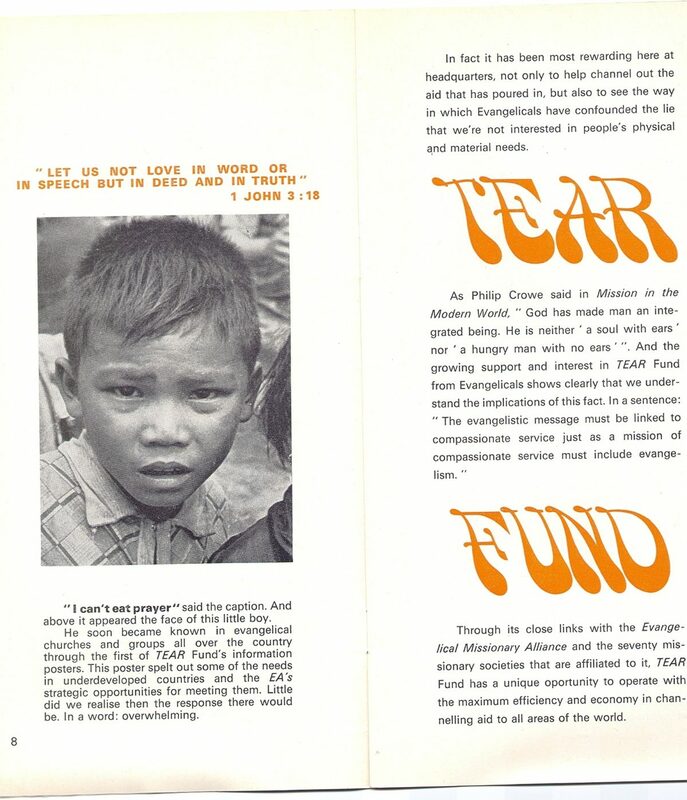 In 1973 Tearfund became an independent registered charity, with 80 per cent of its aid allocated to long term development projects, demonstrating Jesus’ love for the poor in tangible, sustainable and life-changing ways. In 2018, Tearfund celebrated it's 50th anniversary with a campaign promising not to stop until poverty stops. Clive Calver is appointed general secretary of the Evangelical Alliance, ushering in a season of growth and change. At 34, Clive Calver was one of the youngest general secretarys in the history of the Evangelical Alliance. Clive arrived at the Evangelical Alliance from Youth for Christ where he had been director since 1974, as well as being involved in local, national and international church contexts. During his tenure, Clive encouraged the increasing diversity of the Evangelical Alliance membership and worked hard to deepen evangelical unity, increased unity in prayer across the church and the enabling of Christians to act as salt and light in society. He wrote in Christianity Today in December 1996, "As evangelicals have begun to depart from an inherited policy of self-imposed isolation they have emerged from their comfortable ghettos to grapple with the needs of contemporary society." There was a significant increase in membership of the Evangelical Alliance under Clive's leadership. In the early 1980s individual membership stood at between 900 and 1,000 and church membership stood at less that 1,000. By the mid-1990s, individual membership had increased to 56,000 and church membership had increased to almost 3,000. By the time Clive stood down as general secretary in 1997 the profile and posture of evangelical Christianity had altered significantly from it's mid-century stance. Evangelical renewal and growth had given the community greater confidence and profile with which to enter the oncoming new millennium. In April 1984, the West Indian Evangelical Alliance formed. Later known as African and Caribbean Evangelical Alliance (ACEA), this was an independent charity that worked under a partnership agreement with the Evangelical Alliance to represent black majority churches in the UK, closing in 2009 after 25 years. Between 1987 and 1992 the Evangelical Alliance committed to enhancing it's place across all the nations of the United Kingdom, opening offices in Belfast, Glasgow and Cardiff. An advisory group to help the Evangelical Alliance reflect on issues from a theological point of view was established in 1993. Although the name and constitution has changed, the Evangelical Alliance still has a Theology Advisory Group (TAG) today which meets twice a year to discuss major topical theological issues. Rev Joel Edwards is appointed general director of the Evangelical Alliance. Rev Joel Edwards is appointed general director of the Evangelical Alliance, the first black man to hold the position. 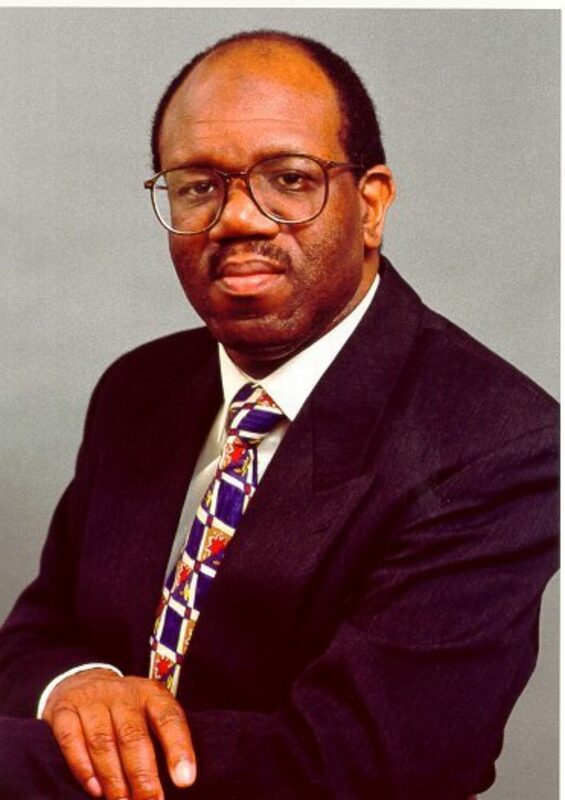 In 1988 Joel Edwards appointed as general director of the African and Caribbean Evangelical Alliance, before going on to become general director of the Evangelical Alliance. During his tenure at ACEA, Joel demonstrated the transforming power of Christ in communities and built bridges between ACEA and churches in the UK, work that he continued to do as general director of the Evangelical Alliance. As the Evangelical Alliance's first black Pentecostal general director, Joel navigated a new route into re-branding the Evangelical Alliance and re-positioning evangelical witness in the 21st century. He facilitated an evangelicalism that journeyed more deeply into the public square, creating partnerships and engaging in the times without losing its soul. Seeking to close the distance between the right and left of evangelical constituencies, Joel believed that unity would be the key to spiritual and social transformation. Through leading initiatives on evangelical mission, social engagement and societal values such as respect and tolerance, Joel presented Christ credibly in the media and in parliament by blending grace and truth. As a regular broadcaster on Radio 4, a member of the Black Christian Leaders Forum, chair of the Churches Media Council and co-founder of Micah Challenge International, he campaigned for government action against poverty, rallied the Church to respond to rising violence in the UK and brought attention to evangelicals in secular spheres. In his 11 years as general director, Joel was awarded an honorary doctorate from St Andrew's University, received the title of honorary canon at St Paul's Cathedral and was appointed a commissioner for the Equalities and Human Rights Commission. On leaving the Evangelical Alliance he wrote, "People should recognise us as good news citizens who are integral to our communities and the public square. Our future as evangelicals is to be at the heart of long-term spiritual and social transformation for our society." Gweini was established in October 1999 by the Evangelical Alliance, Care and Cornerstone Church Swansea as a representative body of the Christian voluntary sector in Wales. The coalition, run under the umbrella of Evangelical Alliance Wales, comprises a range of Christian organisations who come together to represent the Christian voluntary sector to the Welsh government. Gweini also resources and informs churches and individuals who are reaching out to their communities in social action projects. There are now a number of Gweinis in many local authorities across Wales. 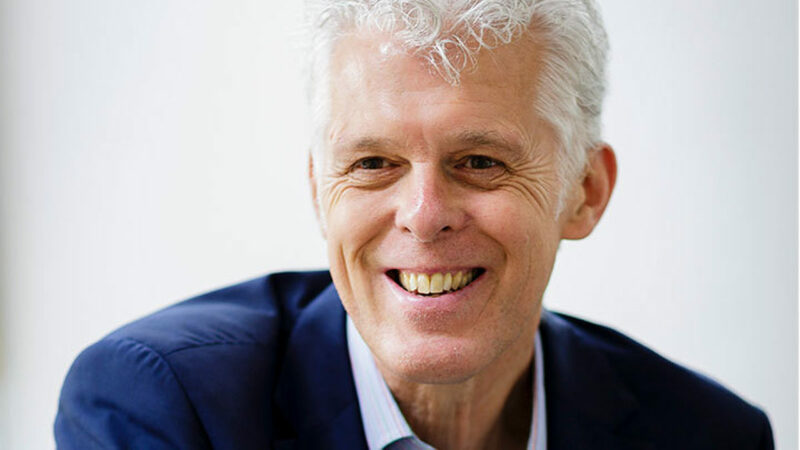 Steve Clifford was appointed as general director in April 2009, coming from a background in church and para-church leadership, both nationally and globally. Steve arrived with a mandate to promote and encourage unity within the diversity of the UK church, and with a passion to support healthy conversation, including in disagreement. Speaking to idea magazine before taking up the post, Steve said: "I think the challenge I'd love to put out there is that if we're going to disagree, let's disagree well. Let's sit in the room and work hard, grapple with these issues, and let's respectfully hear each other, believing the best of each other. These are the things scripture exhorts us to do. Paul writing to the Corinthian church, where there were things that needed to be sorted out, speaks strongly to them as a father and as an apostle. But in the heart of that epistle the challenge that he brings to them is to love each other. And I think that the challenge for us is to relate to each other as God relates to us, even in the midst of our disagreements." The South Asian Forum is launched to help Christians reach the Asian community in the UK with the good news of Jesus. SAF was formed in 2010 by the Evangelical Alliance to unite and support the 75,000 South Asian Christians, originally from the eight South Asian countries, who are now living in Britain. SAF is a member of the One People Commission. They produced the Discovering Jesus through Asian eyes course to equip UK churches to reach South Asians in their area. 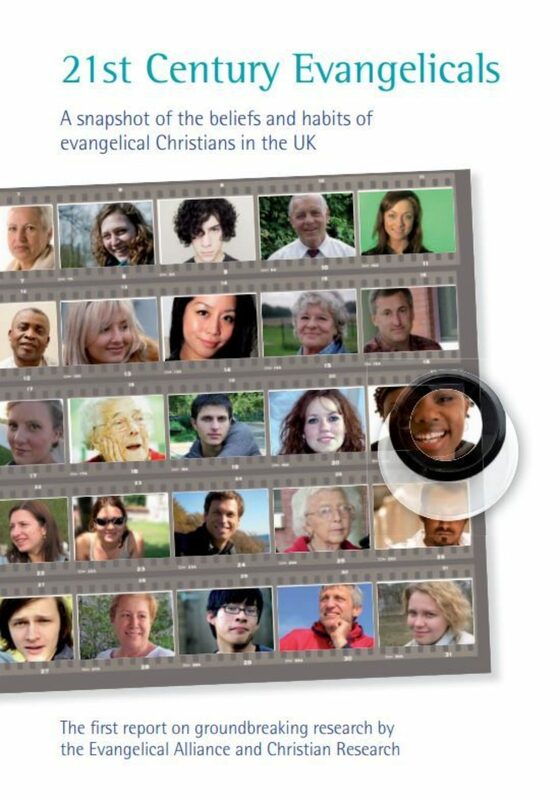 In January 2011 the Evangelical Alliance launched the first in a series of ground-breaking reports on the beliefs and habits of evangelicals in the UK. The aim of the research was to provide churches and Christian organisations with data that would help them better understand and work with the communities they serve. Steve Clifford wrote in the foreward: "By presenting an accurate picture of evangelicals today, we can be much better equipped to make effective plans for tomorrow." Throughout 2010 around 17,000 people completed questionnaires at Christian festivals for the initial survey, including questions on the environment, volunteering, miracles, prayer, giving, women in leadership and evolution. Since the publication of that report multiple other surveys have been carried out on specific topics such as belief and society, communication, money, church life, the family, discipleship, evangelism, politics and poverty. The Biblefresh joint initiative by the Evangelical Alliance and Bible Society to promote a year of celebrating the Bible. Evangelical Alliance and Bible Society research showed that Christians – including church leaders – were increasingly struggling to understand lesser-known Bible passages or read the Bible regularly. 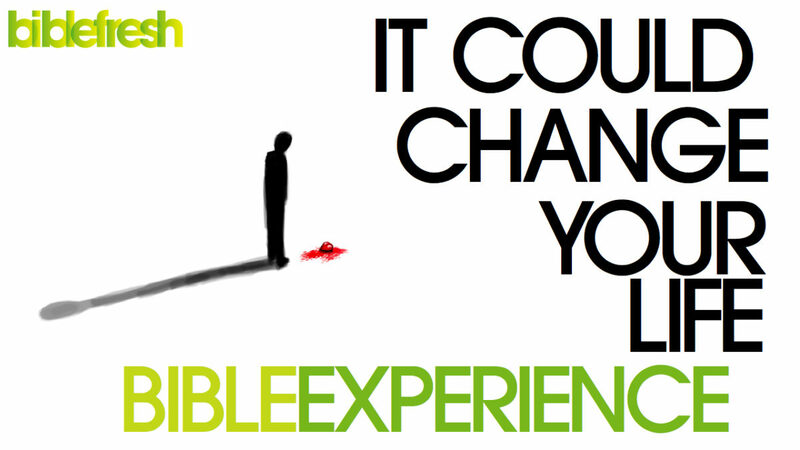 This kick-started the Biblefresh initiative, with 2011 becoming a year of celebrating the Bible. Starting work in early 2010, the Biblefresh campaign involved a large movement of 120 churches, agencies, colleges and festivals. Inspired by the 400th anniversary of the publication of the King James Bible, hundreds of special events, services, publications, courses, articles and a website were produced to make the year a very busy one. The GATHER Network, a unity movement around the UK, was established to draw together churches and Christian communities together in mission. Gather is an national network of vibrant unity movements in towns and cities across the UK. It exists to network and equip groups of churches and Christian organisations working together with a heart for their local areas. Gather offers teaching via articles and seminars that encourage best practice and innovative ways of doing unity and mission together. The network encourages shared practice and the sharing of stories from across the nation as an inspiration and stimulus for other cities and towns to follow and offers links to partnership organisations that work with churches in towns and cities in missional contexts. Gather encourages new and innovative ways for working together for the transformation of our towns and cities through civic gospel initiatives with borough councils, business, media, health, arts as well as through the local church. threads, an initiative of the Evangelical Alliance, is launched to help young adults in their 20s and 30s engage with church and faith issues. Made up of a collective of young adults from across the social spectrum, threads tackled big issues with weekly emails and blogs. Topics included money, politics, discipleship, relationships, leadership and much more. In 2015 threads hosted a hustings event prior to the general election, and in 2016 hosted #girlboss, a event to empower young women. threads was wrapped up in 2018. The One People Commission is set up as a model of encouraging unity while celebrating the ethnic diversity of the UK church. Following extensive consultation and relationship-building with key leaders, the Evangelical Alliance established the One People Commission (OPC). 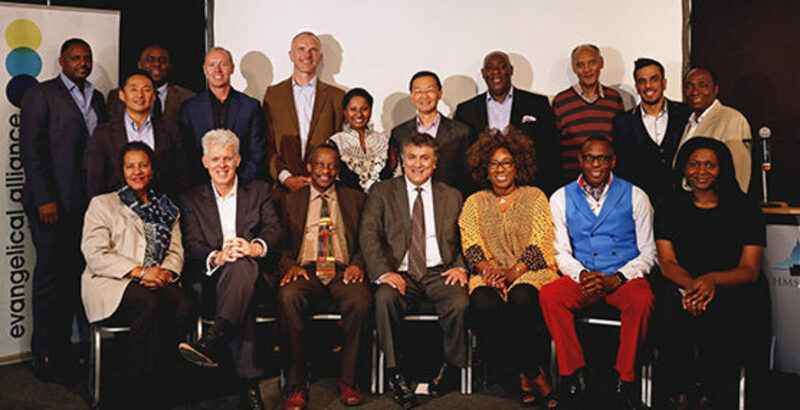 This is a body within the Evangelical Alliance made up of key national church leaders committed to celebrating ethnicity, while promoting unity within the UK evangelical Church. Directed by Rev Canon Yemi Adedeji, part of the role of the OPC is to ensure the Evangelical Alliance is representative of the diversity of the UK church. Adoption and fostering charity Home for Good is launched as a result of an Evangelical Alliance campaign. In 2011, the desperate shortage of foster carers and adoptive parents in the UK made headline news. Realising the potential of the Church to meet this need to find families that could care for vulnerable children, several Christian leaders who were also foster carers or adoptive parents committed to working together to raise the profile of fostering and adoption within the UK Church. At this stage, Home for Good was a campaign run in partnership between Care for the Family, CCPAS (Churches’ Child Protection Advisory Service) and the Evangelical Alliance. In March 2013 the initiative Home for Good launched with the aim of making fostering and adoption a significant part of the life and ministry of the Church in the UK. 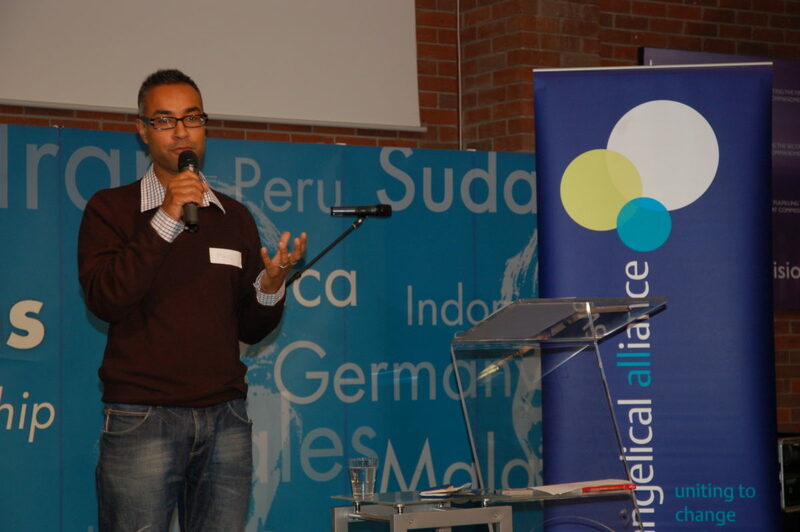 At the forefront of the initiative was the Home for Good book, written by Krish Kandiah, then director of mission and England at the Evangelical Alliance, along with his wife Miriam. in September 2014, Home for Good became a charity in its own right with a vision to further inspire, encourage and equip the Church. 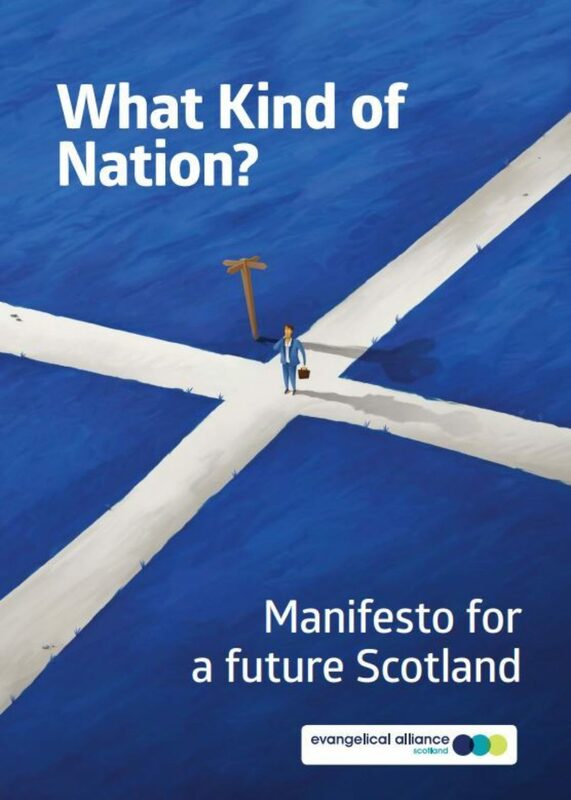 The Evangelical Alliance in Scotland produced What kind of nation? to provoke Christians in Scotland to think and discuss what kind of nation we should be working for ahead of the independence referendum. Around 90 politicians and faith leaders from across Scotland gathered for the launch event at Holyrood, in which the Alliance also announced it would be hosting hustings in seven cities around Scotland, bringing together high-profile MSPs for debates ahead of the referendum in September. The response was overwhelming, with the team invited by both churches and politicians to discuss the future of the nation. After the success of What kind of nation? 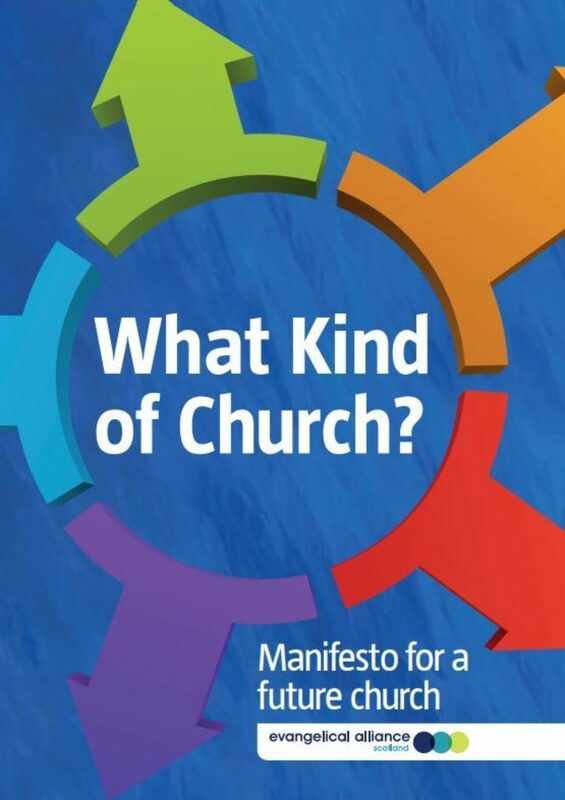 the Evangelical Alliance in Scotland were then challenged to write a similar document, now focusing on what kind of church we need. It was felt by some that while it is great to work and pray for a just and merciful nation, the question that should have come first was whether the church in Britain is fit for purpose. So the What kind of church? 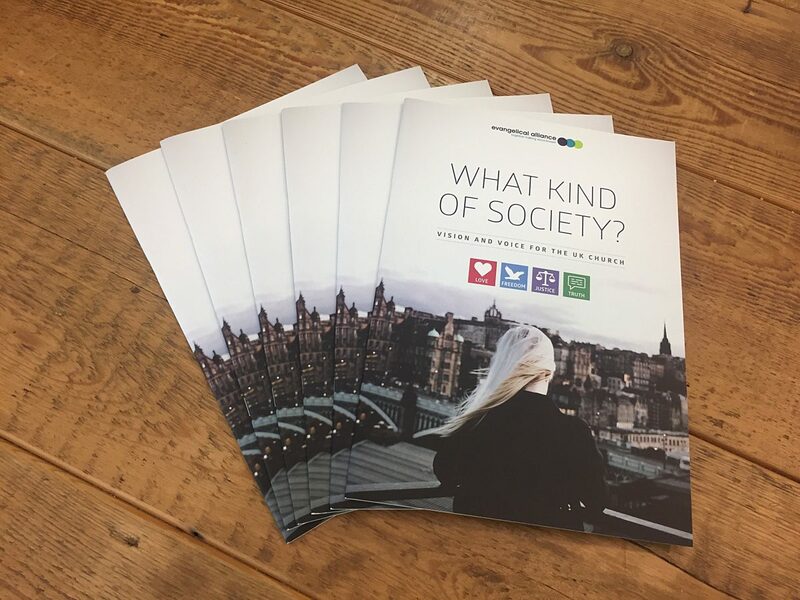 report was released, with the team also launching a series of eight videos encouraging the church to make a difference for today – to carry the culture of the kingdom of God for this generation. They then toured Scotland with events in May 2016 in Inverness, Aberdeen, Edinburgh and Glasgow. 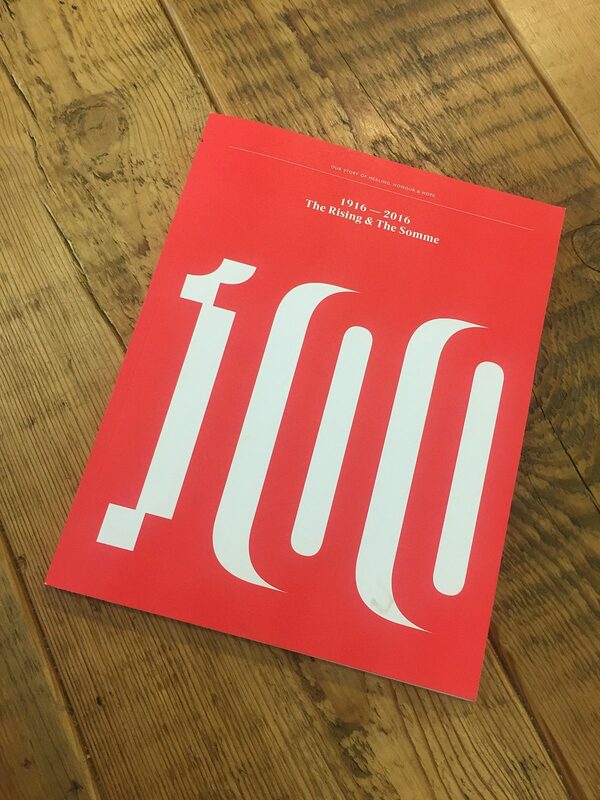 The Evangelical Alliance in Northern Ireland published 100: Our story of healing, honour and hope to mark 100 years since the Easter Rising and the Battle of the Somme. Partnering with Summer Madness and 24/7 Prayer, the Evangelical Alliance in Northern Ireland produced 100: Our Story of Healing, Honour and Hope - a collection of interviews and articles reflecting on one hundred years since the events of 1916, and looking forward to a hope-filled story for the next one hundred years. Among a wide variety of features the magazine included interviews with the first minister Arlene Foster and deputy first minister, Martin McGuinness, the attorney general for Northern Ireland, John Larkin and Ulster Rugby player, Ruan Pienaar. 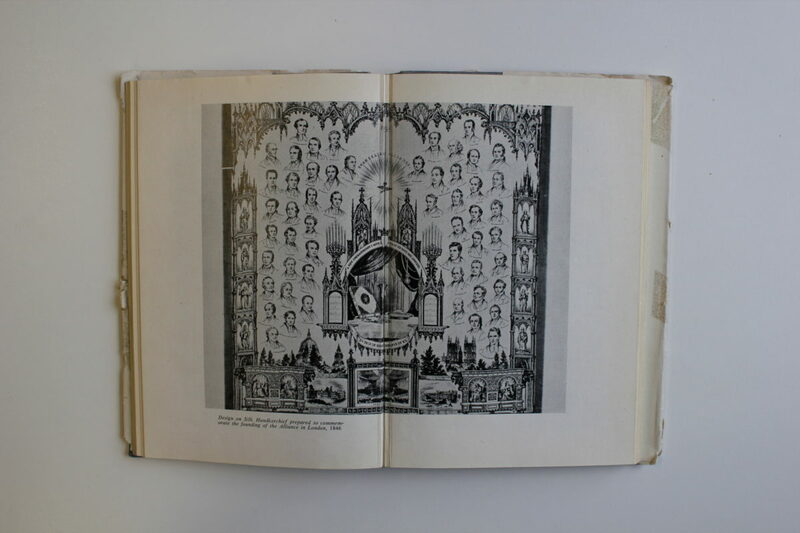 Other contributors included the Archbishop of Canterbury, Justin Welby, former Lord Mayor of Belfast, Nichola Mallon, and photo essays of the art-works of the Bogside artists and Ross Wilson. The Evangelical Alliance celebrated 170 years of working to unite the church in the UK in sharing Jesus and speaking up for Him in society. Different celebrations were held during the year, including an event with Clive Calver and Steve Clifford in conversation and an evening celebration service held at All Souls Langham Place. The Evangelical Alliance launch a website, greatcommission.co.uk, to serve as an online hub for evangelistic resources. Greatcommission.co.uk was designed to inspire a passion for evangelism and empower individuals and churches to be talking about Jesus. The website brings together a variety of stories about people who have come to faith and also stories of different ways Christians have shared their faith. Users can search for resources to use dependent on who they want to reach, what type of activity they'd like to start or using a specific season or festival in the year. 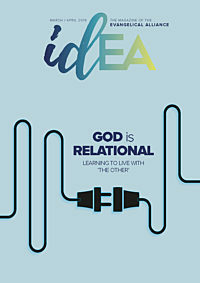 There are resources designed to meet a range of understandings of Jesus – for those who know a lot about Jesus but haven't made a commitment to become a Jesus-follower, and for those who are just beginning on their journey of discovery of the Christian faith. A joint resource from the Evangelical Alliance and the Lawyers' Christian Fellowship, Speak Up, was designed to equip and inspire Christians with confidence and knowledge of their legal freedom to share Jesus. Speak Up was designed to encourage Christians of their legal freedoms to share Jesus in an environment which was growing increasingly hostile to the Christian faith. The resource established the freedom and privilege of being able to speak up and demonstrate the love of God and the transforming power of Jesus in the UK and provided a clearer understanding of the current legal freedoms. What kind of society? is launched to inspire Christians to think about how the foundational values of love, truth, freedom and justice could shape 21st century society in the UK. The Evangelical Alliance believed that the Christian faith has provided the foundations for a flourishing society based on love, truth, freedom and justice. The resource asked, what do we want and how do we best communicate what we want? What kind of society? was designed to provoke and address these questions and to get the church started with what it needs to practically cast a vision and be a voice for the good of all. Launching a year after the referendum on membership of the European Union, What kind of society? sought to address big questions in a time of political and social turbulence. It also provided the foundation of the Evangelical Alliance's contribution to the national conversation around the snap general election. A thousand delegates gather in London for the first-ever Movement Day UK. Leaders from across the country met together to seek the cultural, social and spiritual transformation of their communities. Hosted by Roger Sutton, director of Gather, an initiative of the Evangelical Alliance, the conference brought together people from all spheres of society to equip and encourage Christians working to see their communities transformed in Jesus' name. 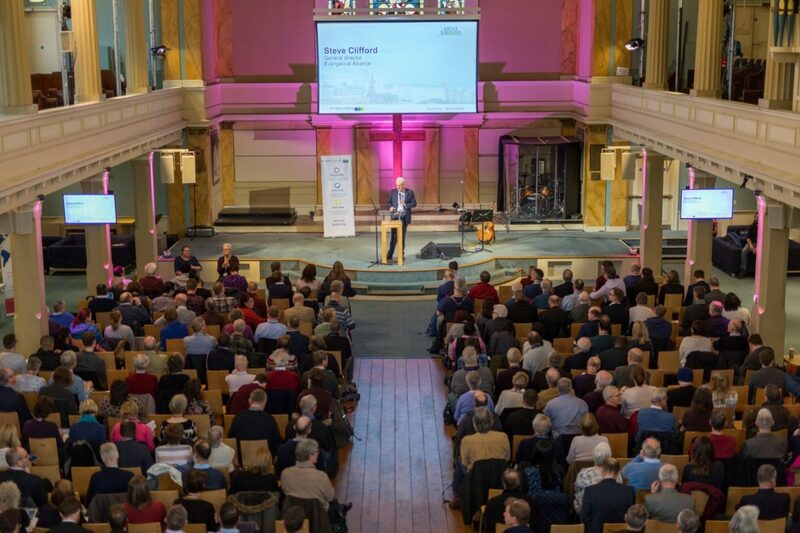 Steve Clifford, general director of the Evangelical Alliance, said: "I came away from Movement Day tremendously encouraged by what God is doing in our towns and cities. 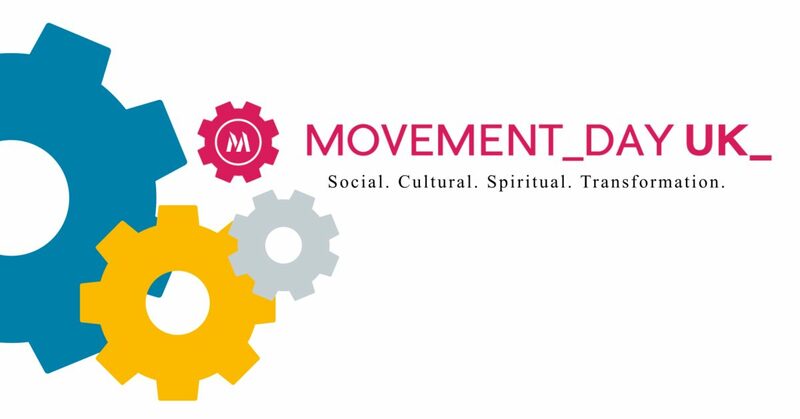 For us at the Evangelical Alliance, Movement Day represented an answer to so many prayers and provided us with the fresh challenge of building on what was achieved in our short time together. "Movement Day enabled us to learn from one another, to hear the stories of unity movements not just in the UK but across the world. We heard not just from church leaders but from Christians in public leadership who are building strong, prayer-filled relationships with a shared passion to see spiritual, social and physical transformation in our communities." Movement Day started in the United States in 2010. It envisages a church which is reaching all parts of society, working together strategically and intentionally to further God's kingdom. Seminars and themed tracks covered all spheres of public life, from the arts and media to business and local government. SAF hosted a track equipping leaders for cross-cultural mission led by Usha Reifsnider, SAF coordinator and the Evangelical Alliance's Public Leadership team led a seminar allowing delegates to share some of the challenges faced by public leaders and to explore how churches can support and equip public leaders in their midst. The One People Commission, established by the Alliance to develop unity across all ethnic expressions of the church, shared their story on the main stage. Hundreds of delegates gathered in Parliament Square in the shadow of the Palace of Westminster and Westminster Abbey to pray for our nations. Prayers were led by Steve Clifford, Pastor Agu Irukwu and Bishop Angelos amongst others. During the final session attendees were asked to share what they were planning to do in their communities. Many shared that they would be returning to home to build better relationships with other churches and Christians in their communities, in the hope of developing local unity to work together for transformation. The inaugural Above and Beyond conference was held, helping Christians to run their churches and charities excellently particularly around good governance. More than 300 delegates from churches, charities and Christian organisations across the UK attended the Evangelical Alliance’s inaugural Above and Beyond conference on 20 February 2018, held to support churches and charities gain more clarity and insight on regulation and law, and how to navigate the challenges, maintain compliance and thrive. Expert speakers from organisations that specialise in the charity and faith-based sectors, as well as a prominent member of parliament, gave keynote presentations, led seminars and participated in a panel discussion. working with the Charity Commission, and safeguarding. At the conference, which was supported by Stewardship, Fiona Bruce MP spoke heartfelt words of encouragement in her keynote address entitled 'The contribution of faith groups to civil society'. She pointed to the recognition MPs (Christians and non-Christians alike) gave to Christian organisations making a difference in communities across the UK, and emphasised the importance of retaining the freedom to practice our Christian faith. The Evangelical Alliance continues to commit to building confidence in the gospel, celebrating a vibrant church, and being a trusted voice in society. As part of the Evangelical Alliance's commitment to church unity, mission and advocacy, it continues to seek to support Christians and the UK church to share Jesus and speak up for Him in society. The Great Commission hub, the South Asian Forum and the One People Commission continue to serve the cause of unity and mission. 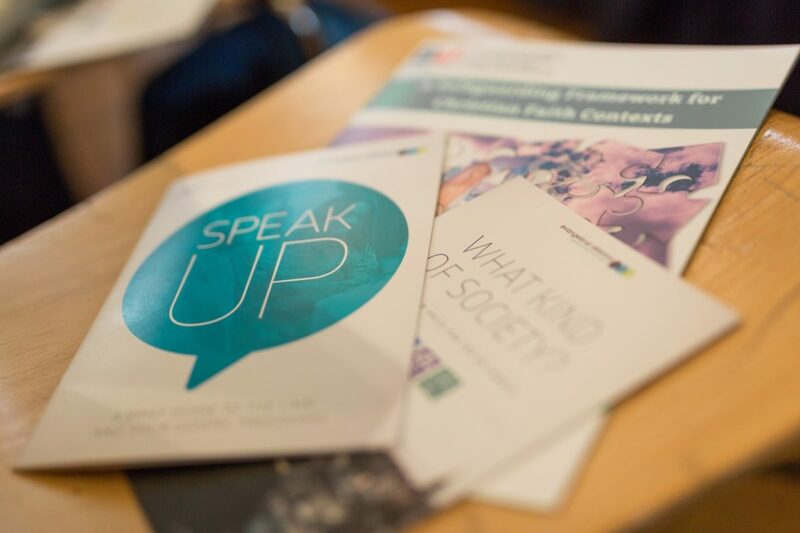 Speak Up, Public Leadership and the Evangelical Alliance's public policy work continues to equip Christians to engage with society and be a voice for good. Our national offices in Scotland, Northern Ireland and Wales continue to serve the church in their nations, equipping and inspiring Christians in unity, mission and advocacy. Explore more of what we're up to.